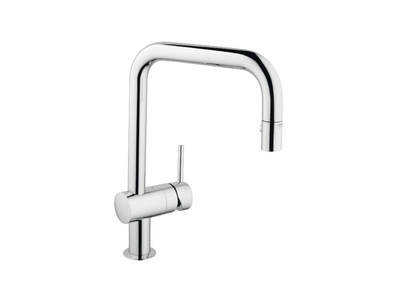 The Minta® dual-spray kitchen pull-down faucet with its sleek architectural lines is the perfect finishing touch for the contemporary kitchen. 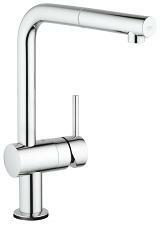 Good looks are combined with functionality and the angled swivel spout design allows even the largest pot to be filled without difficulty. 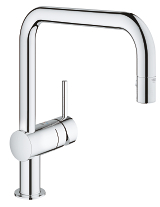 Minta® features a locking, dual spray pull-down with an integrated minimalist spray head. 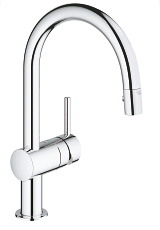 The superior Grohe SilkMove® ceramic cartridge ensures precise and seamless temperature adjustment from hot to warm to cold. 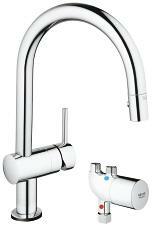 The GROHE WhisPer® technology provides the soothing sound of a gentle stream of water without any irritating whistling. 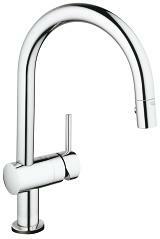 Minta® is available in brilliant Grohe StarLight® chrome and SuperSteel InfinityFinish™.